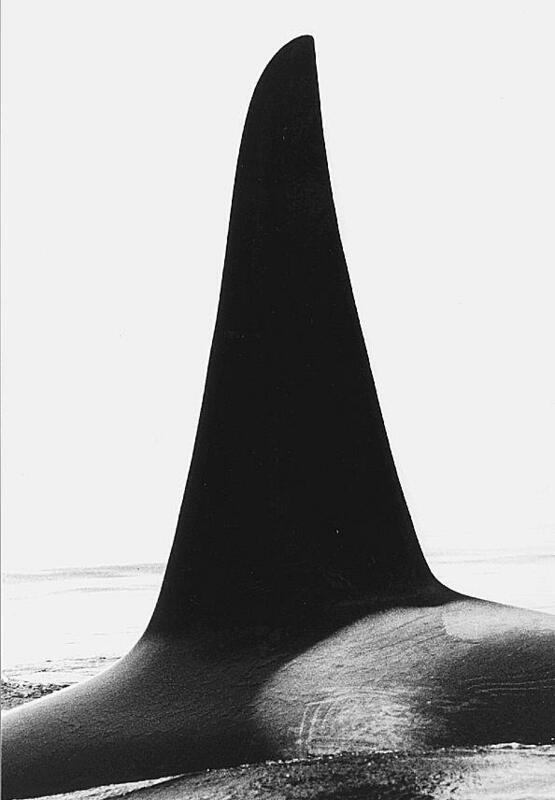 The matriarch A12 is called "Scimitar" because her dorsal fin has the distinctive curved shape of the sword. 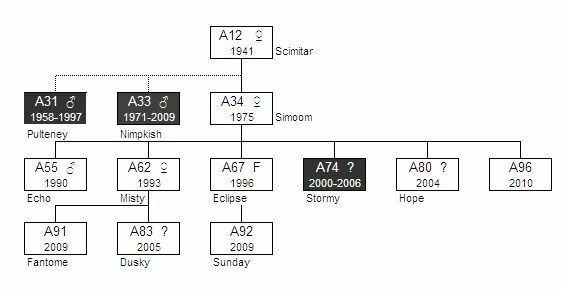 Born in 1941, she had two youngsters with her when she was first seen in the early 1970s... her sons A31 (Pulteney) and A33 (Nimpkish). 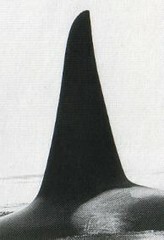 In 1975 her daughter Simoom (A34) was born. For many years the profile of the family was that of a mum with two growing sons and a daughter swimming beside her. 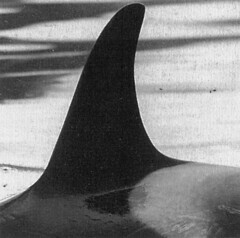 When the sons became adults and Simoom started having her own babies, the picture of the A12s was that of a perfect orca family. 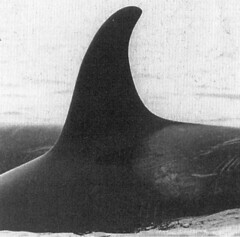 Nimpkish became "Uncle 33" because he spent much of his time with young Echo, while his brother Pulteney continued being his mum's closest companion. Pulteney died in 1997 at age 39. Today, the family's focus has shifted to the new generation of Simoom and her 5 babies, though granny Scimitar and Nimpkish are always nearby, too. Simoom is a special mum to us partly because of the timing of the birth dates of her babies... all five were born in late October or early November! In 2005 A62, Misty had her first born A83. From now on this matriline counts 4 generations. 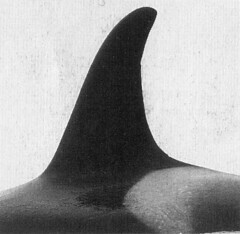 In 2006 the fourth youngster of Simoom, A74 Stormy was missing. He is considered dead by now at the age of 6. June 19 2009. Orcalab reports: Jared and Stubbs Island Whale Watch informed us before they came into Blackney Pass that there are two new babies in the group! A62 and A67 are new mothers! A62 Misty had her second calf, designated as A91, Phantome. A67 Eclipse had her first calf A92, Sunday. 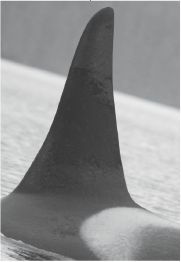 A34 Simoom had her 6th calf A96 in 2010. In 2012 A12 was reported missing and presumed dead. Scimitar died at the age of 71. Video of the A12 matriline in the Robson Bight. 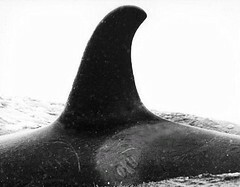 Recorded September 2000 from the Lukwa. gradual rise to 1709±185 Hz. 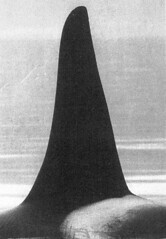 Scimitar (A12), is the matriarch of the A12 Matriline. The code shown above her name (F:1941) indicates that she is female and scientists estimate she was born in 1941. 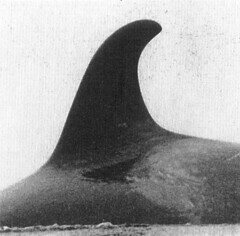 The two whales shown below are her two surviving offspring Nimpkish (A33) and Simoom (A34). 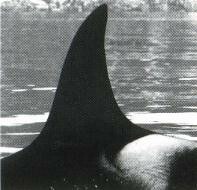 As with many killer whales in the resident population, Nimpkish (A33) and Simoom's (A34) father is unknown. 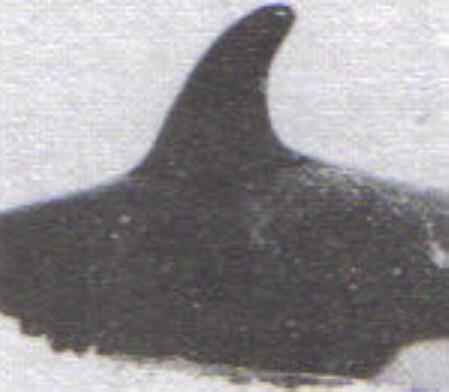 Nimpkish (A33) is an adult male killer whale thought to have been born in 1971. He will travel with his mother Scimitar (A12) and sister Simoom (A34) and her offspring throughout his life. Nimpkish died in 2009 at the age of 38. 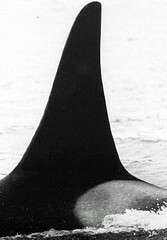 Echo (A55) is a young male killer whale born in 1990. 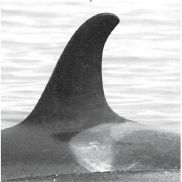 Normally researchers would have had to wait until Echo reached sexual maturity, at around age 14, to determine his gender but new techniques in DNA sampling have allowed them to determine the gender of Echo (A55), his sisters Misty (A62) and Eclipse (A67). 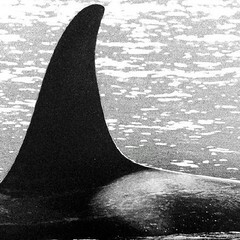 Misty (A62) is a female killer whale born in 1993. DNA sampling has shown that Misty's father is a whale known as W2 who is part of R-Clan. 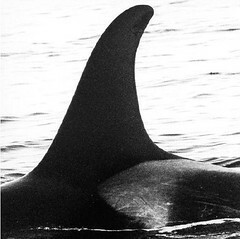 In 2005 Misty (A62) get her first calf Dusky (A83). In 2009 Misty got her second calf Phantome, A91. 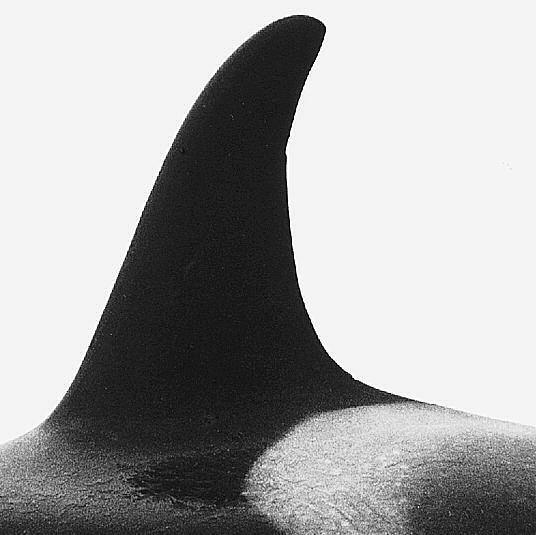 Eclipse (A67) is a young female killer whale born in 1996. She had heer first calf in 2009: ID A92, Sunday. In addition to the loss of C21 (from the C6s) and A59 (from the A35s), it looks like A74, Stormy (from the A34/A12s) is also gone. This is the first A34 calf, that we know of, to have died. The report comes from Graeme Ellis. Graeme remarked that he was surprised as A74 had seemed to be very robust & energetic last Fall and was showing that he was a very good hunter. We personally have felt a strong connection to A34, as most of her calves have been born in the Fall and in this area. And this has meant that we have seen her calves very soon after their birth. 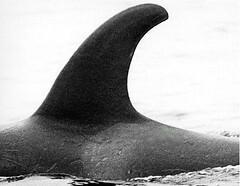 Stormy was most likely born shortly after a large superpod swept through Johnstone Strait on August 20, 2000. At that time, some of the groups (including the A12s), travelled all the way east to Campbell River. When the A12s returned "up the Strait", a short while later, Stormy was there! 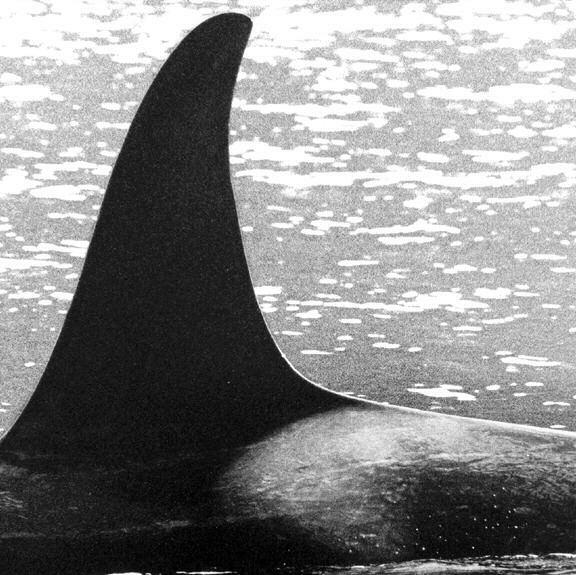 We will never know what happened to Stormy but the news about Quadra (C21) and Canoona (A82) is a reminder to us all that the orcas are vulnerable. Their home has become a busy, hectic, noisy place.